Sun Hats & Wellie Boots: Let's Go Read Outdoors! 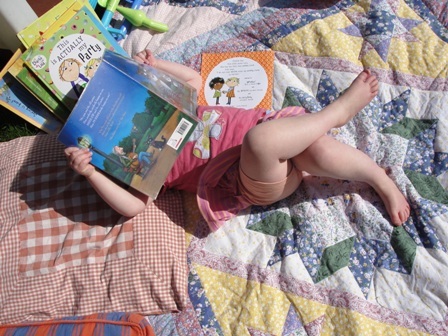 We love sharing books together in a variety settings, but there is something special about exploring a book outdoors. Here are 5 reasons why we love reading in the open air. 1. 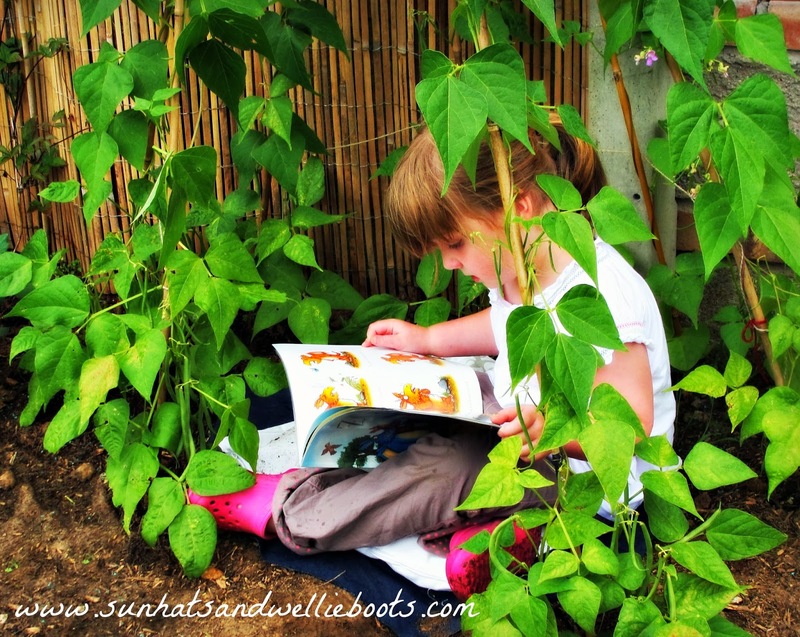 Reading outdoors in the fresh air surrounded by nature offers a great multi-sensory reading environment. 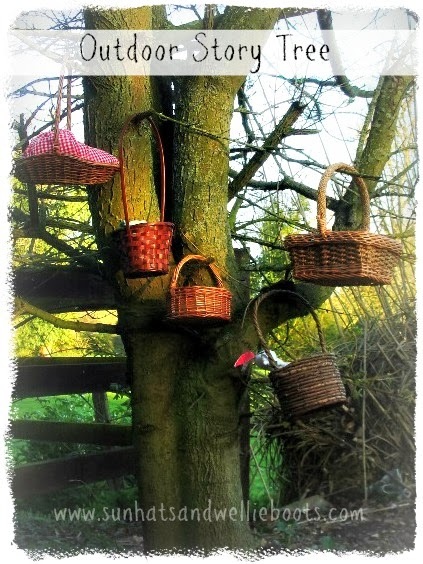 Not only can you feel & experience the seasonal changes & weather around you, you become aware of so much more; the sounds of nature (birds, trees etc) unrestricted space, natural textures & open skies. These could be seen as distractions & reasons not to take children outdoors to listen to a story, but maybe they can enhance a storytelling experience. Maybe they add another dimension, an opportunity to explore a story in an alternative way, using nature to help tell the story. 2. Reading outdoors also offers children space, space to act out the narrative, or to move in ways which an indoor environment would restrict. Children have the opportunity to be loud, they have space to sing & dance, & express themselves more freely than within the confines of four walls. 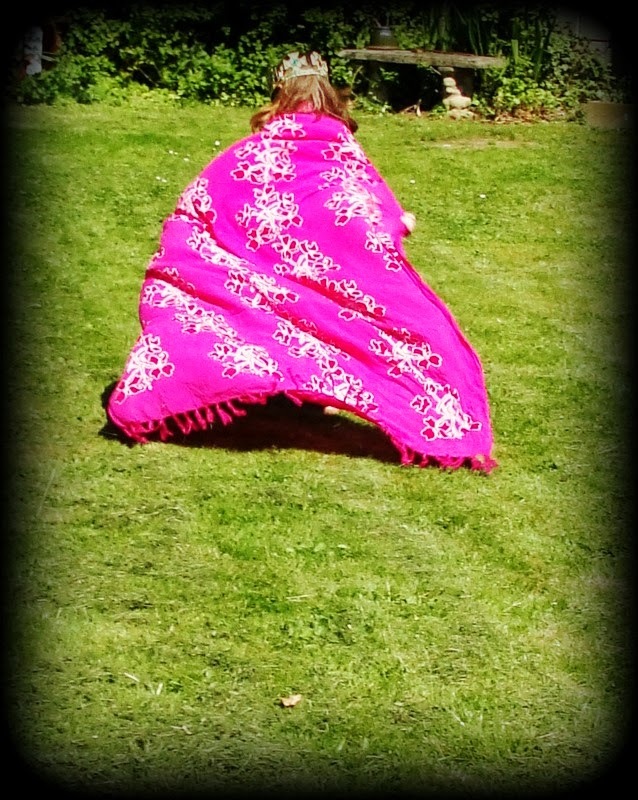 A story read outdoors can burst to life & be explored in a whole variety of ways. Our outdoor Story Tree provided a fun & practical outdoor reading area to explore, & one which was able to evolve with children's interests. A reading space like this can help create a sense of wonder & excitement about books, & encourage a magical discovery of stories. 3. An outdoor setting can also offer a peaceful place to enjoy a story, a place to be still, to spread out, to read in a quiet natural location. 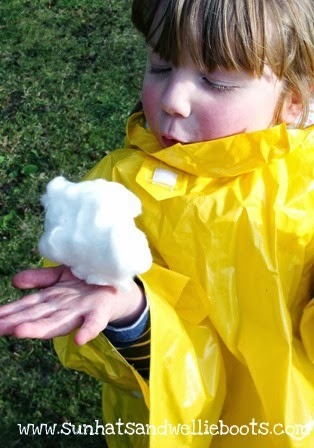 It can help to calm children, to help them focus & concentrate, & appreciate their natural environment. Listening to a story being read outdoors can also help develop children's concentration & listening skills. 4. 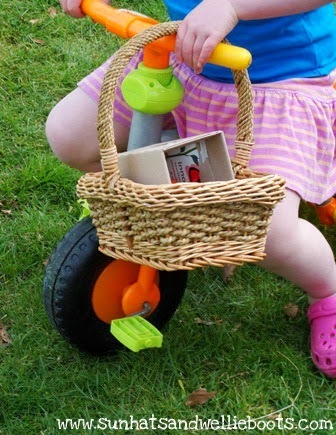 Exploring books outdoors is fun, & can become a real adventure, it can also encourage reluctant readers to engage with a story in a way which may not be possible indoors. 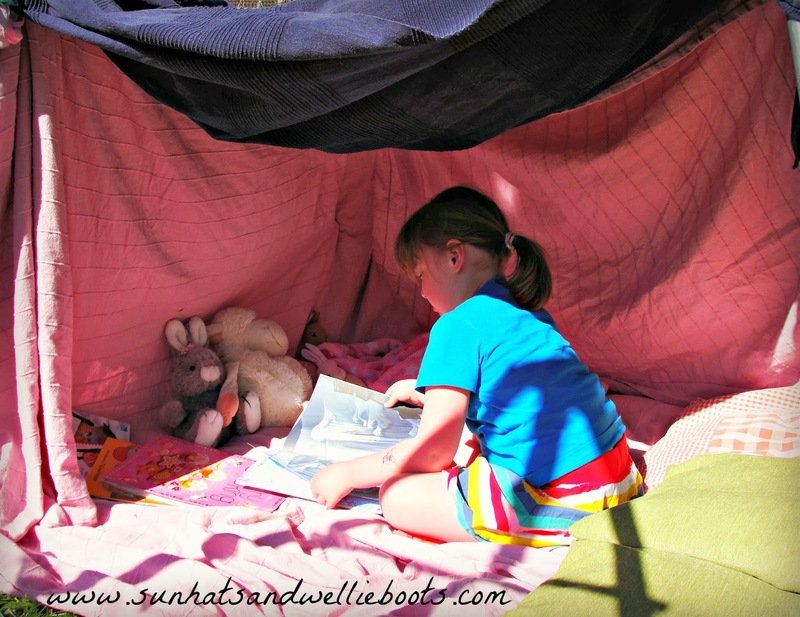 Building a den or putting up a simple reading tent with blankets gives children the opportunity to discover an outdoor reading space which they can take ownership of. 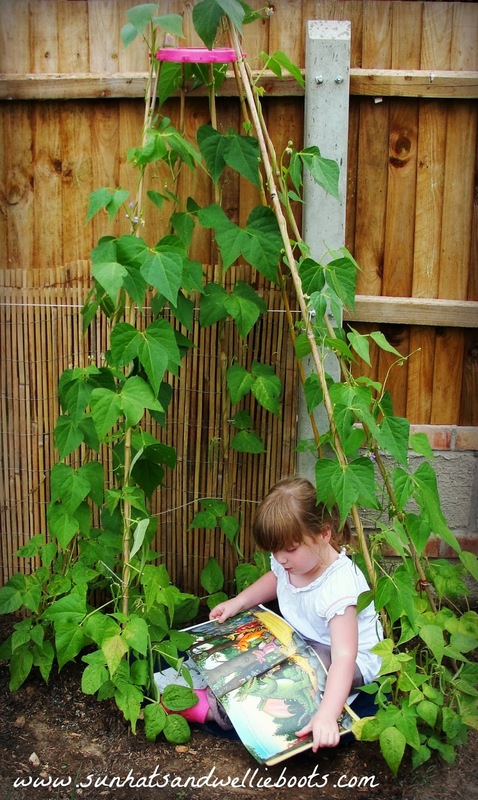 One of Minnie's favourite reading spaces last Summer was in the veggie patch! 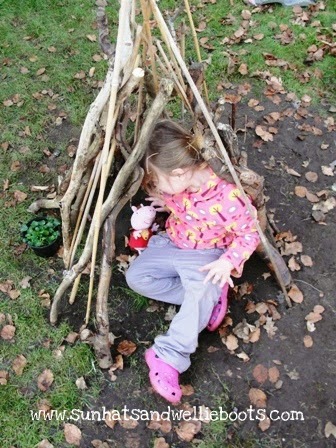 She planted beans around a simple wigwam structure & grew her own living tent. With a few cushions added to the centre her reading tent was ready for use. 5. 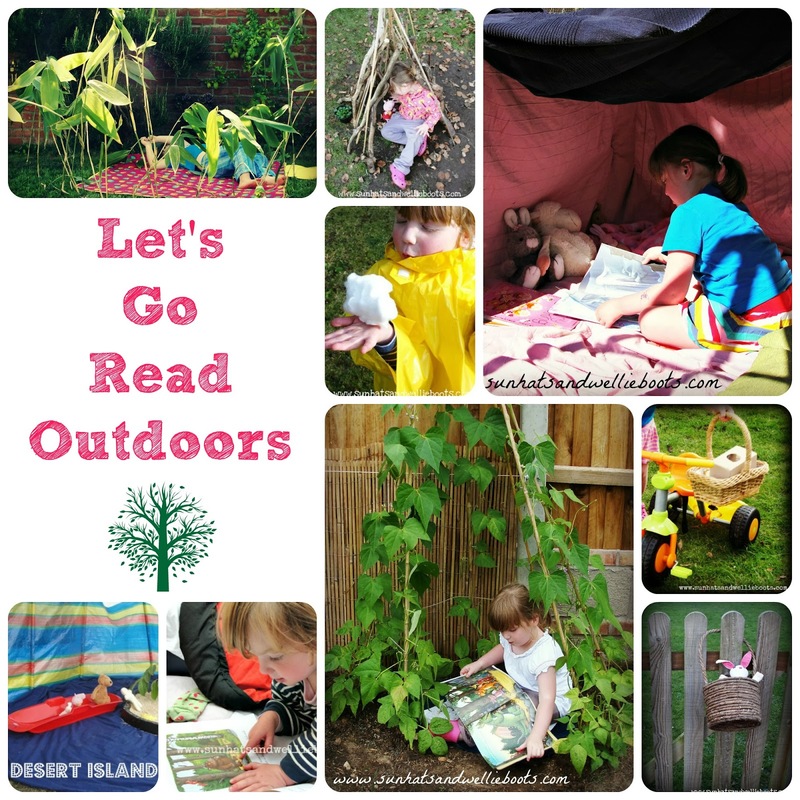 The great outdoors is a wonderful place to develop a child's love of reading. All you need is a little time, & imagination. So if you haven't tried reading outdoors why not try giving it a go this Spring, grab a book, a blanket & see where your reading adventure takes you. To celebrate World Book Day in the UK I'm joining together with these amazing UK bloggers in the #loveliteracy linky.